In our daily life, we uses a small electronic equipment for giving power supply to our Computers and other sensitive electronic equipment which needs interruption free power supply. 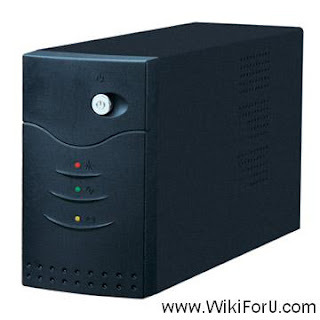 This small electronic equipment is known as UPS. First of all let us know what is U.P.S. UPS is an acronym for Uninterrupted Power Supply. This means that UPS is an alternative power source which gives interruption free supply of power to the load. UPS supplies the power continuously to the lead whether main supply OFF or ON. The main application of the UPS is that it provides power to load in the absence of Main supply or any interruption in main supply. The source of energy of UPS are batteries. The back up time (For how much time UPS can supply power to load in the absence of main power supply) depends upon the type and quantity of batteries used. With the development in Electronics and Computer based devices, the use of sensitive electronics equipment like Personal Computers, Super Computers, Data Processors, Digital Controllers etc increases. Such devices requires interruption free power supply, because these devices have to handle with data in Memories and Processors. As we know these devices are very sensitive to corrupted power supply. For example, If you Turn Off your Personal Computer directly by removing power plug instead of shutting down then you will lose your data and sometimes your computer’s operating system may get corrupted. So when dealing with large data in large scale industries it is essential to provide interruption free supply to these devices for the safety of data. To fulfill this need UPS (Uninterrupted Power Supply) is used. Voltage Fluctuations: In mains power supply, the voltage generally increases or decreases than rated voltage. For example, in our homes the voltage fluctuates from 210 Volts to 240 volts. We can see these fluctuations by connecting a digital voltmeter to supply. The large change in these fluctuations may cause damage to equipment or corruption of useful information (data). Transient Impulses: The original sine wave of alternating supply can be disturbed by any reason which will result in instant increase or decrease in amplitude. These disturbances are known as Transient Impulses. The instant increase in amplitude is known as spike and instant decrease in amplitude is known as notch. Voltage Surges: When we connects a heavy load to power supply, the voltage of whole system may increase or decrease for a small time. These variations are known as Voltage Surges. Noise: A distortion in alternating sine wave which comes for small duration is known as Noise. The main causes of addition of noise are Radio and TV transmission and poor grounding. Noise may cause damage to data or equipment. Frequency Variation: The instantaneously change in load may cause the variations in supply’s frequency which may cause damage to useful data. Black Outs: Instant failure in mains power supply due to any reason is known as black outs. In the case of black outs, UPS maintain continuously power to load from batteries. UPS transfers supply very quickly (in micro seconds) so the device and data will safe. Brown Outs: The planned power cuts imposed due to over loading of power are known as brown outs. The power supply can be maintained from other sources during brown outs. Rectifier: As we all know that the main function of rectifier is to convert alternating input supply to D.C. which will be used to charge the battery and then fed to inverter circuit. Its output may depends upon the load requirement. Battery: The storage battery is used to store energy for future use in case of main supply failure. This battery may be lead acid or any other type depends on the requirement. Inverter: It does the invert process of rectifier. It converts the incoming D.C. supply to alternating power supply for the use of load. The output of inverter is sine wave. It converts D.C. to A.C. of constant frequency and amplitude. The output of Inverter may contain harmonics which can be eliminated by using external circuit or special type of inverters. Static Switch or Transfer Switch: A static switch or transformer switch is required to change over the circuit that is to transfer the source of power. The operation of this time should be very fast. Generally, the switches having switching time within 10 milli seconds are used.